Thinks he is more impressive than his comrades do...likes to show off his sharpshooting. Boisterous, loud-mouthed...raucious sense of humor makes him welcome company. Vain - upset by even the smallest scratch in his gun barrel. Can go 30 mph over roughest terrain, hit a hex nut 1.5 miles away. Shoots explosives, thermal, cryogenic, acid, and sonic shells. Great strength but helpless if upended. Wherever the fight is, that’s where Warpath wants to be. His super heavy armor and powerful weapons mean he doesn’t have to worry about things like orders or tactics. He just heads straight for wherever the fighting is heaviest, pouring fire into the enemy, and hoping theres someone left standing to give him a good fight when he gets there. BLAM, ZOWIE, BINGGG, KERBLUNNNG, KAPOW. These are some of the words you will hear from Warpath every time he tries to speak. In fact its almost every other word he utters in the G1 cartoon. 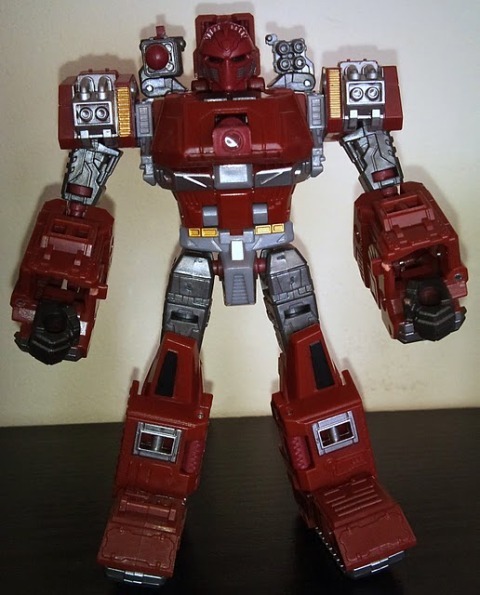 My earliest memory of Warpath was from the UK G1 Marvel comics as the 80’s animated cartoon was hardly seen on normal TV, usually in the school holidays for approx 15 minutes a day on Wacaday or for the full 30 minutes at weekends on the The Wideawake Club. Warpath came into the cartoon during Season 2 with no explanation as to how he arrived. The last time he was seen in the cartoon that I recall was in the Season 3 episode 'Ghost in the Machine', where Warpath was stationed at Metroplex when Scourge and Starscream's ghost came by to steal the city-bot's eyes for Unicron. Back to the 80’s Marvel G1 comic series. The first we see of Warpath was in the story titled The Smelting Pool as part of a resistance group consisting of Blaster, Perceptor, Seaspray, Powerglide, Cosmos and Beachcomber. The group were trying to help Blaster rescue his friend Scrounge from Straxus’ smelting pools. They were unsuccessful however, but afterwards Blaster knocks Straxus off the space bridge. The group end up on Earth and immediately lost to a group of humans who were part of RAAT led by Circuit Breaker (Josie Beller). Warpath and his group had their heads removed and bodies dissected by circuit breaker, but eventually was released... only to encounter Galvatron. Warpath was the first to fall along with Perceptor. Warpath's group was saved by the Dinobots and eventually joined the other Autobots aboard the Ark. Warpath was last seen during the Underbase saga where he was apparently deactivated. Warpaths alt mode is a H-tank of sorts. Not resembling any real life tank that I know of. His colour is primarily a deep red with a small mix of silver,grey and black. Warpath features a movable turret, non firing missile/flak cannons and also a working missile launcher. There are a total of four of the new (as of 2010/11) C-Clamp pegs on show which allow weapons from other Transformers figures to attach to Warpath. On the sides of the front tread sections we see some lettering. On one side there is ZOW-333 and the other is K4-90W. On both the rear tread sections we see an Autobot symbol also in black. A lot of the robot mode is hidden nicely. The only problem is that the tread sections are not aligned level. The front are slightly higher than the rear, making for a slightly wobbly alt mode when put on a flat surface. The treads and wheel detailing are all painted in silver. The treads do not move unfortunately. Instead, the tank moves about on 4 small plastic wheels which are placed into the middle of the underside of the tread sections. A minor gripe for me is how much the missile sticks out of the rear of the launcher. I know toy safety standards have to come into consideration but it really makes the accessory look awful. I guess a remedy would be to shorten it by cutting the missiles tail section down so that its level with the rear of the launcher. Or just leave it out completely. 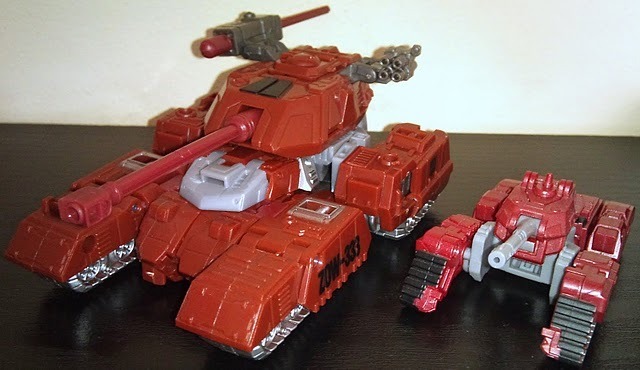 Transforming Warpath is fairly easy and can be done fairly quickly unlike some of the previous molds in the Classics, Universe and Generations line. Push the turret barrel inwards to reveal the head. Turn the missile launcher and pod upwards 90 degrees. Use you nail on the grey section below the turret and lift upwards. Continue to pivot this section 90 degrees to reveal the waist/hips/legs. Separate the legs and move them down 90 degrees and turn the legs again 90 degrees to face the front. Carefully pull the tank treads from their peg on the legs and rotate downwards to form Warpaths feet. Close the section where the treads were to finish making the legs and feet. Locate the grey section below the turret again and pull it downwards until it stops, then continue to pull and the red section behind it will also move down to form part of Warpaths chest. This will click into place when done correctly. Next hold Warpath waist with one hand and with the other rotate the upper body 90 degrees to locate into Warpath waist. The upper body is now formed. For the arms. Locate the C-clamp posts and you will notice there actually on a hinge joint. Open the cover fully and rotate the silver tread section through 180 degrees to form the shoulder, upper and lower arm. Flip out the fists and close the C-clamp cover to make the forearms. Now we see Warpath. Quite a big difference from his original G1 and recent Legends design. Apart from being much larger than his previous incarnations, this one offers much more detail and articulation. There are 8 pairs of articulation and 1 single point of articulation (16 if counted separately). These are the knees, upper legs, hips, wrists, two separate sections of his elbows, upper arms, shoulders and head. This is quire a lot compared to other figures in the same class and offers different methods of display. The colours on show are mostly the same as the alt mode but with a little bit of gold visible on the shoulders and hips. Warpaths upper arms and legs are a darker colour of grey from the rest of the greys. Warpaths head is the familiar rounded design with black eyes and silver detailing on his faceplate. The whole design of the face looks like some sort of ninja style design. Warpaths gun turret chest is on show as well as the missile launcher and pod located on opposite shoulders. Everything on warpath is folded away nicely and nothing is left loose or just hanging off the figure. Its all finished neatly. For me, there are two things that spoil Warpath as a whole. These are the missile accessory that I mentioned before, and the small wheel on Warpaths feet which doesn’t tuck away anywhere when in robot mode. This version of Warpath is certainly surprising and I couldn’t help but feel pleased that I bought it. Even at the higher price tag this one is going for due to limited stocks. A bit of articulation at the chest cannon, ankle and waist areas and this perhaps could be considered as Masterpiece Warpath! Transformation Design: 7 Not particularly hard but very fun unfolding all the parts. Durability: 8 Warpath feels very sturdy and well built. Only thing I can see going missing is the missile accessory. Aesthetics: 8 Looses points for the missile accessory sticking out behind the figure but other than that he’s a great display piece. Articulation: 8 Articulation on the chest cannon, feet and waist and this would be perfect. 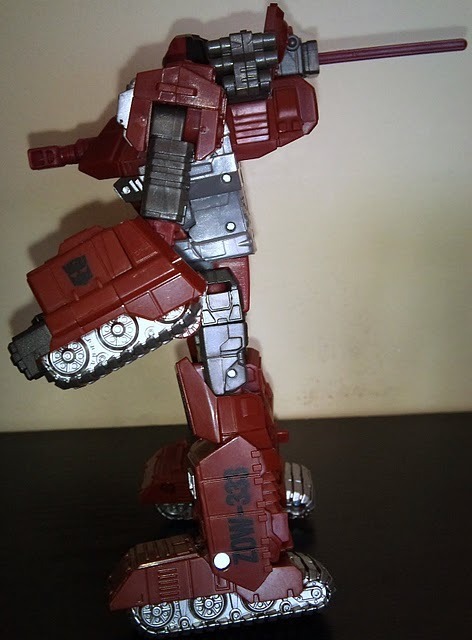 Overall: 8 Warpath has a few very minor faults but he is still an excellent purchase. A must buy.